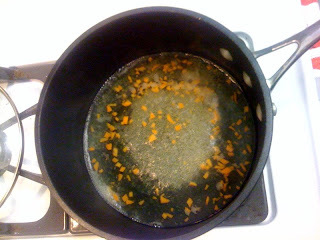 I've finally graduated from the "melting wax in an old steel can in a pot of water" technique to a bona fide, honest-to-goodness double-boiler setup. Dipping the cheese directly in the wax is slightly trickier than brushing it on, but it produces a smoother "shell" around the wheel, gets more even coverage, and ends up looking just so much nicer. The outside is a smooth surface, rather than all those rough brush strokes. Don't run out of water! As I got low on wax, it started boiling. I lifted the top pot out and found the bottom had boiled off all the water. Whoops! Watch out for steam burns! Wax Paper can indeed catch on fire! 'Nuff said on that topic. Wax vapors can ignite! So make sure you're working in a well-ventilated area. Remember to chill the cheese before waxing! I always forget this step, and it makes a huge difference in the workability of the whole thing. 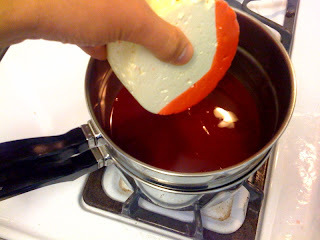 If the cheese is cold, the wax cools and hardens on it faster, making it a much easier process. I ended up having to put the wheels in the freezer for a few minutes between each coat. While Dana and I were stirring the Playa Del Rey Pepper Jack, Lindsey went to work on a 100% Whole Wheat Bread. A quick Google search turned up this recipe at RecipeZaar (love the spelling, btw). This was her (and my) first attempt at making bread, and I must say I am most impressed. 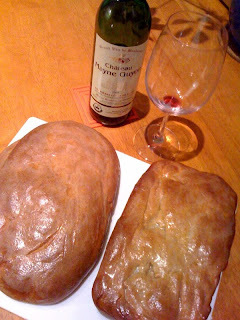 Although it's probably not the healthiest of breads (no water--only milk and butter! ), it sure is tasty. That bonus "sheen" on the loaves is all the butter we slathered on top. Hey, that's what the recipe called for! How could we say no? Yes, the bottle of wine was empty by the time we got to the documentation. The other night my friends Dana and Lindsey came over to lend a hand with a fresh batch of cheese. 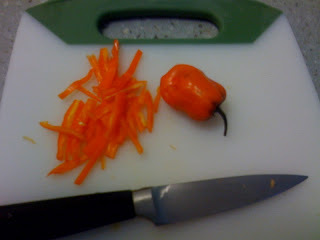 Our mutual friend Sean grows his own Habanero Chiles, and was kind enough to share a few with me. 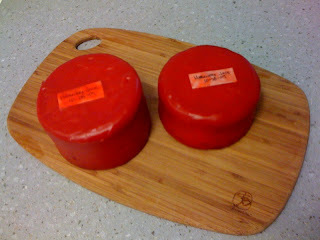 Natch, we used them to make a Monterey Playa Del Rey Pepper Jack. A few weeks had already passed before I made use of the peppers. 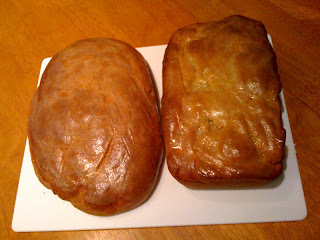 Unfortunately, a bit of mold had started growing on two of them, so I had to toss those (sorry, Sean!). BUT, I figured two would probably be enough anyway, though -- they're damn spicy. (Note: Use gloves when handling these suckers!). I'm also not sure if there's enough salt. Ricki's recipe may have a few typos*... She calls for only one gallon of milk (most of her hard cheese recipes use two gallons), but I figured I'd trust the recipe and double all the other ingredients. Not that it matters, since we forgot to double the calcium chloride and salt (but we measured the "proper" amount of rennet--using the double-strength stuff). I guess worst case scenario is that we'll need to make a speecy-spicy-salty dipping sauce in a few months! 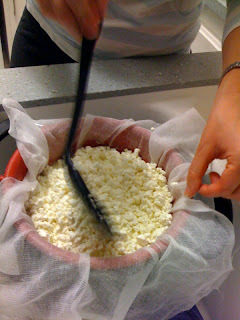 Draining the curds, just before mixing in the peppers. * Besides the one-gallon/two-gallon potential goof, the recipe calls for pressing at 1-pound for 15 minutes, and then at 4-pounds for 12 hours. I'm guessing she really meant 10-pounds and 40-pounds. Didn't catch that until after we had already pressed at 1-pound... the curds knit together okay, but the edges are a little lumpy. Live and learn, I suppose. I've been looking for ways to spend less money, simplify my life, and increase the quality of my life... all at the same time. I had a small victory this morning to that end: Homemade Roasted Pepper Hummus. Super-easy to make (throw it all in the blender), and tastier, cheaper, and healthier than the store-bought stuff. Total cost: $6.65, for about a quart (!) of hummus. An equivalent amount of Trader Joe's Mediterranean Hummus--three containers, I'm guessing--would have been about $9.87. Not a massive savings, though I suppose if you eat a lot of hummus throughout the year, that 33% savings could end up saving you hundreds, if not thousands!... The bottom line is that I saved three bucks and am getting a whole lot of satisfaction out the homemade stuff. Footnote: I suppose I did cheat a little bit with the Tahini Sauce and the Peppers... I could have made my own for both of those, of course, but for me it's more about finding the right time/work/cost balance rather than making sure everything is as homemade a possible.